To start with, bat exclusion must only be done when you are sure there are no young bats in the property, which might get killed because they have been ripped from their mothers. Secondly, this is not a job that you will want to do if you are not experienced, knowledgeable in bat species, or clued-up on the law of bat removal. It is unlawful in most places to kill bats, trap bats, exclude bats, or try to move bat roosts during specific times of the year, including May through to September (approx.). Before you install any devices, you must note down the location of every single hole that is 3/8 of an inch or bigger. That's the size a bat needs in order to get into your home. The best time to find bat holes is at night, a couple of hours after the sun has gone down. Not all bats will leave the roost at that time, or at the same time, but that's when the majority of the colony will head out to hunt for food. By watching where they fly from and to, you'll have an idea of where the most-used holes are. In reality, the actual device that you use doesn't matter too much. You could even create something DIY-style. All you need to do is make sure that it CANNOT harm the bats in any way, and that the device is attached correctly. Materials that you can use include netting, funnel-creations, actual exclusion devices that you can buy, or anything that creates a one-way system – the bat must be able to fly out of the building and off into the wild, but without the ability to regain entry. There are a lot of websites and tutorials that will give you step-by-step guides on how to make and install these, but we do not advise you perform your own bat exclusion mission. Getting rid of bats can be ... tricky. In most cases, wildlife control exterminators and bat removal experts have trained for many years, working closely alongside fully-trained bat removal experts, and undergoing various courses to get accreditation, which then allows them to get insurance to work at residential or commercial properties. 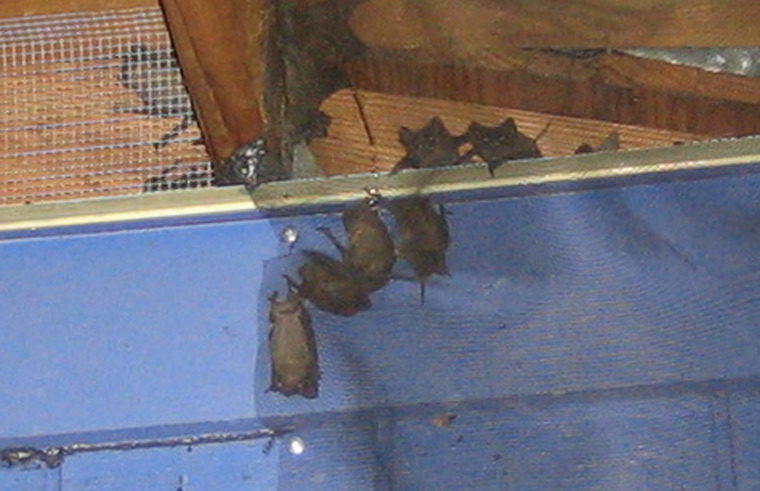 If a bat removal EXPERT would train for two years or more before they would even attempt single-handedly removing bats with exclusion methods, it would be silly to think that you could learn everything you needed to know to get the job done safely, humanely, and – above all – legally, in just a night or two. Go back to the Bat Removal page, or learn about bats in the attic with my Bats in the Attic guide.